Why is our Social Action a big part of us at TBS? We have a great history in Social Action that we must preserve and… thanks to some remarkable people who give so much of their time, we will. Nat and Edie Lamm, z’l, were one of the original temple members whose dedication to social action began what is now a very proud tradition with our congregation. As our temple community has grown and evolved, so has our drive to be outstanding members of both our Santa Ana and Orange County communities. Cookie Stern, z’l, led the initial Mitzvah Day. Monica Engel and Hollis O’Brien initiated what now is the sixth year of Mitzvah Meals feeding over 1,200 people per month. Our involvement within the interfaith and prison community led by our rabbi, cantor, Worship Committee, Sisterhood and Brotherhood auxiliaries has brought TBS national recognition. We walk for the Jewish World Watch and support them with with donations for solar stoves and backpacks. We stand on the shoulders of those who inspire us to do great work. We work closely with the county’s Adopt-a-Social Worker to provide food, clothing and other necessities to those less fortunate. The countless hours and devotion by our many volunteers is very much appreciated. There are Social Action projects ongoing in every area of our synagogue including Religious School and Preschool. 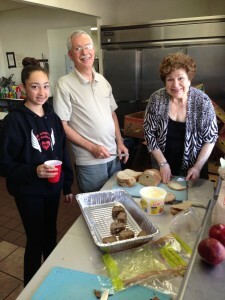 Read the latest about Social Action at Temple Beth Sholom!